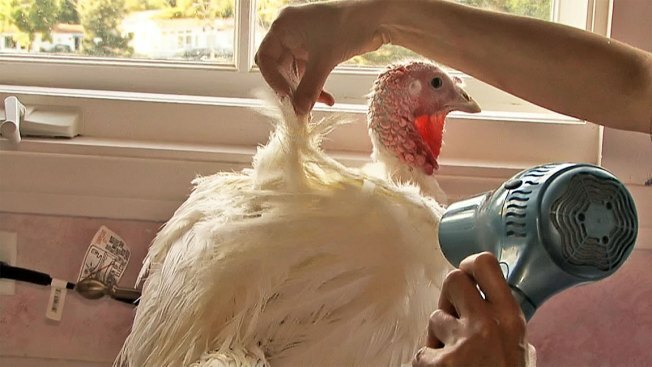 A turkey gets star treatment at the hands of activst Karen Dawn. "Ellen" and "Portia" will be honored guests at Thanksgiving dinner at the house of Los Angeles activist Karen Dawn. But these aren't Hollywood stars, they're turkeys. Continuing her annual turkey rescue, Dawn saved two female turkeys from an LA slaughterhouse, bringing them to her Pacific Palisades home for some 4-star treatment: a bath, blow-dry, playtime and a spot to lounge. Not to mention the spot of honor at her annual vegan Thanksgiving feast. "Ellen" and "Portia," named for DeGeneres and De Rossi, will eventually end up at animal sanctuary Gentle Barn, where they will live out their merry turkey lives. "Thanksgiving has now become the most fun holiday of the year. And while yes, I do this, in part, to send some serious messages, the main message is simply: how much more fun is turkey day, when the turkeys are alive and well?" said Dawn.